TheLawAssist.com is a software for lawyers, law firms & corporate houses. This software brings an ease to lawyers by managing their court cases efficiently, generates cause lists, maintains case history, facilitates file attachments and updates lawyers & their clients over email or SMS on case progress. Its proactive SMS/e-mail reminders on next date of hearing, advance search, access from anywhere & court dashboards access are some of the most admired features by lawyers. RIMUS Technologies Pvt Ltd is a group of industry leaders with 20+ years of experience in mobility, information security, networking/network management and telecom domains. Teamed by passionate people with excellent IT industry record, managing national & international customers. Maintain case history, generate daily case list. Sms & email reminders on an upcoming hearing to lawyers and their clients. Exchange notes with clients,attach relevant documents,print case details to physical filling. Access/manage case from anywhere using android & Ios apps. A short introductory video about 'TheLawAssist.com'. 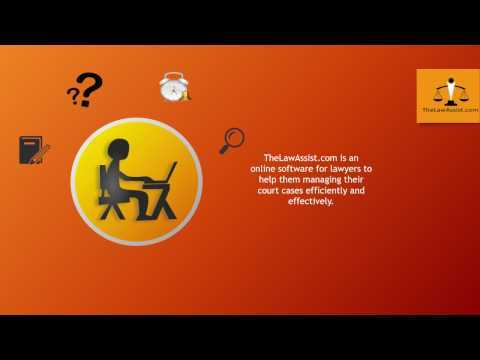 TheLawAssist.com is an online software for lawyers to help them managing their court cases efficiently and effectively.